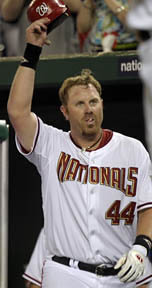 “Big Country” Adam Dunn is not one to waste words or swings at the plate. “I look for a pitch to hit, and hit it hard,” Dunn said after his recent brush with greatness (July 7) when he became the 345th MLB player to hit three home runs in a single contest. “I don't have an approach to change," Dunn said. "That's all I've got." Statistically speaking, Dunn really knows how to get ‘er done at the plate, having assembled the fifth-lowest career at bats per home run average in MLB history. His 13.96 ratio (about one home run every 14 times he comes to bat) is eclipsed only by 500 HRC members Mark McGwire (10.61), Babe Ruth (11.76), Barry Bonds (12.90), and Jim Thome (13.68). "It's pretty cool to hit three homers, but the last one was obviously the biggest since we won," said Dunn, whose third homer came after the Padres had scored twice in the top of the eighth to close to 6-5. "I don't feel any different than I have in the past. I got pitches to hit tonight and didn't foul them off like I've been doing." It worked for the Washington Nationals slugger who became the first player to hit three home runs in a game at Nationals Park, while reaching (and surpassing the 20-homer mark for the 10th straight season. To date, he has 338 career home runs – and this season is a little more than half over. Since Ned Williamson of the Chicago White Stockings became the first to hit three home runs in a single contest on May 30, 1884, 344 other players have done so a total of 492 times over the past 127 years. Click here to view a complete list of MLB hitters who’ve gone yard three times in one contest. That puts Dunn in pretty rare company, including Johnny Mize and Sammy Sosa who each accomplished the feat six different times – while Dave Kingman, Joe Carter, Mark McGwire, and Carlos Delgado who did it five times each. Only once has the feat been completed twice in the same game by two different players. On September 25, 2001, Richie Sexson and Jeromy Burnitz both slammed three out for the Milwaukee Brewers VS. the Arizona Diamondbacks. Twenty-nine players have hit three in one game with more than one team, including Kingman, Mize, Alex Rodriguez, and Mark Teixeira who did it with three different teams. So Dunn, who is rumored to be going to the Chicago White Sox or another playoff hopeful, has some ground to make up to before he makes it to the top of the all-time list…not to mention into the 500 Home Run Club.